Primary School Assistant Teacher Job Circular 2018 has been published by Directorate of Primary Education. This is a circular under Directorate of Primary Education For “Assistant Teacher” vacant positions. This is a temporary post job circular. Permanent residents of Rangamati can be apply for this job. Primary School Assistant Teacher Job Circular 2018 related all information will be found on Rangamati Hill District Council’s official website dpe.rangamati.gov.bd and also from our website jobs.lekhaporabd . 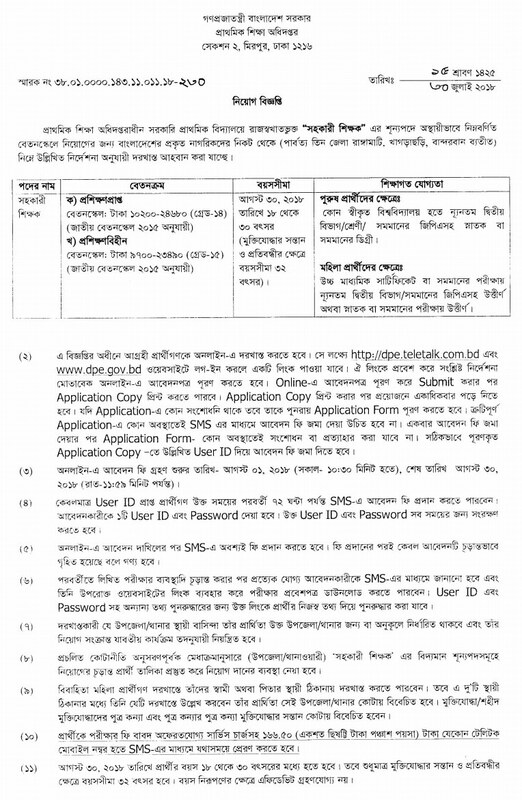 Application form for Primary School Assistant Teacher Job Circular 2018 in Rangamati Hill District Council will be found on Teletalk Bangladesh Limited Website http://dpe.teletalk.com.bd/. If you want to apply for this job, you should submit your application within 22 October 2018. Primary school assistant teacher job circular 2018 has been converted to an image file, so that everyone can read easily or download this job circular.